I've a collection of manual typewriters that numbers just three. Some folks in the Typosphere own dozens. I'd probably have dozens myself if I had the room, and my wife permitted, and if I didn't already have too much photographic gear taking up space at home. The thing about my camera gear is that I try to use as much of it as I can, from my modern Lumix G1 micro-four-thirds digital to my WWII-era Anniversay Speed Graphic. Digital, roll-film, large-format sheet film or alternative media like paper negatives and pinhole cameras, I like them all. The same can be said about typewriters, I like all kinds but especially portable manual machines. 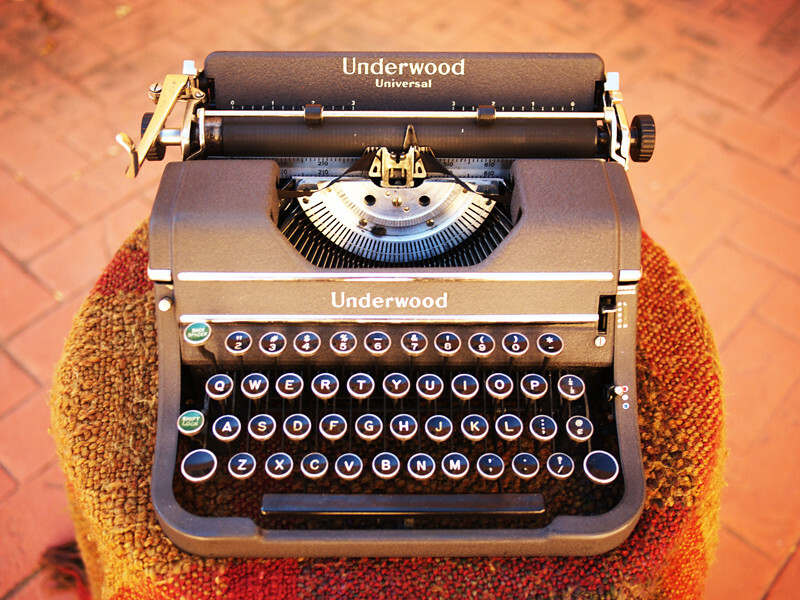 This first machine in the top photo is an Underwood Universal from the mid-1930s. It has that classic crinkled enamel finish, has a very smooth action and exudes that warm smell of machine oil, and has the original case. Its round keys and classic lines make it a great object to exhibit on one's desk, but it's also entirely useful for writing with, not just as decoration. I purchased it here in Albuquerque, from Brown & Smith. The next machine is my true travel typer, a Royal Mercury. Not seen in the picture is the plastic, snap-on lid that seals up the machine nicely. 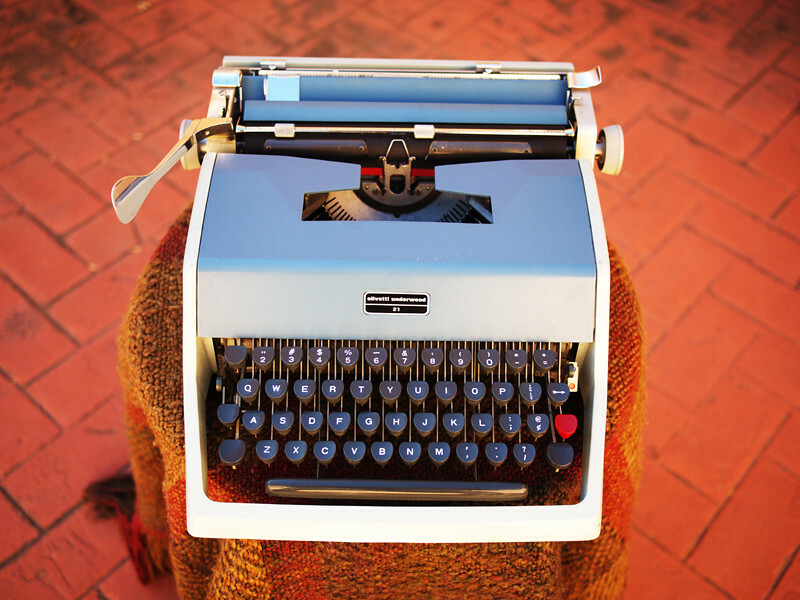 I've taken this little guy on vacation the last few years, and have sat in a beach chair at Oceanside, California and typed blog entries. Its action is not as smooth as the Underwood, but it's a lot smaller and lighter. Purchased from Business Systems & Machines, also here in Albuquerque. This last machine, an Olivetti Underwood 21, is my most recent find, acquired at a thrift shop that itself disappeared a few months after the purchase. 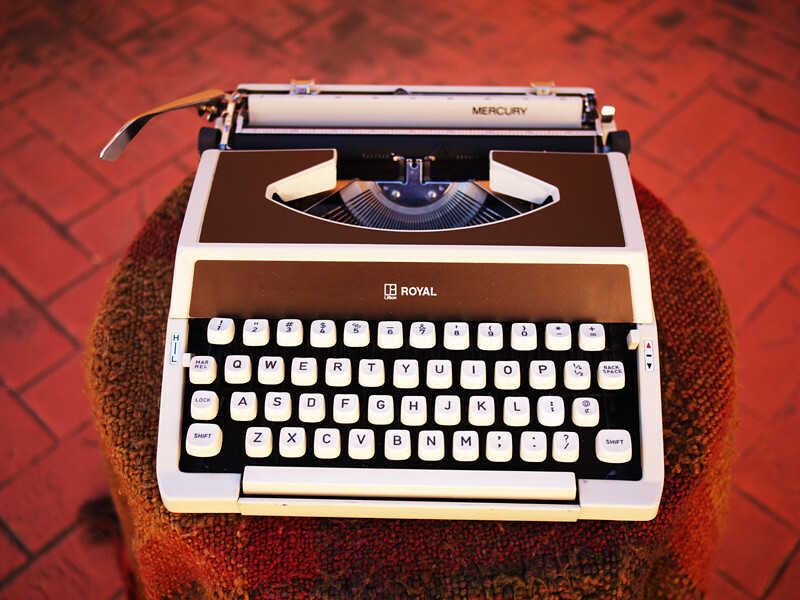 The original owner of this machine came to Albuquerque in the early 1970s, from "back east," on a motorcycle, and traded the bike in for the Olivetti, with which he hoped to be a writer. He owned it up until just a few years ago. At least, that was the story the thrift shop owner told me. When I got the machine home, after paying my $20, I found the original owner's manual, inside of which was the receipt for the typewriter, indicating a trade-in between car lot and office supply store. It types very smooth and precisely, and has not needed any service. In fact, I don't believe it's been serviced since new. Well, there you have it, Joe's manual typewriter round-up. Three may not be a large collection, but they take up enough space, and are all that I can justify using on a regular basis. I should also mention that there's a third typewriter store in Albuquerque, Duke City Typewriter, that I've never visited. Perhaps a field trip is in the near future, after which I may have to find room for a fourth member of my manual typewriter family! I drove down to my favorite coffee shop this morning in our new car, a Subaru Forester, wondering if I'd get into a wreck but simultaneously thinking that a new car is supposed to give one a sense of joy, not worry, and passed a number of commuters on motorscooters, who appeared to be as joyful and satisfied of their transportation choice as I am of mine. I used to own a motorscooter, a little 49cc Italjet brand twist-and-go two-stroke, with which I used to commute 30 miles round trip per day. I weighed about 200 pounds, and the scooter, it had only enough horsepower (ponypower?) to get me up to 53 mph on a level road. Uphill, it was slower. So I learned, from having ridden bicycles around town for years, to use side streets and other slower-speed-limit avenues as a means of avoiding the inevitable conflicts that would arise from a too-slow-accelerating bike in fast-accelerating-SUV traffic. On a bike, there are no fender-bender accidents, only trips to the hospital or mortuary. I would leave the house at 6am, still dark and cold even in the summer, and drive miles across town on a slower feeder street that's named Comanche Road in my part of town, but becomes known as Griegos Road when it winds its way through the historic Hispanic neighborhoods of Albuquerque's north valley. I'd pass a city park at about the same time every morning, where the same man would be walking his dog. Our two schedules were so finely in phase that he'd be rounding the edge of the park at the same time that I'd be passing by, so I got in the habit of beeping my little tinny-sounding scooter horn every morning, and he'd wave back in response, like two ships passing in the night, signaling each other in semaphore. I wondered, years later, if he ever made mention of the guy on the scooter in the dark early morning hours that would ride by and honk. I would turn north onto 4th street, what used to be the original Route 66 before the realignment of the 1930s, when the historic highway made a lengthy detour from Santa Rosa, New Mexico north to Santa Fe, and then south, along the Rio Grande valley and its various Pueblo villages, to Albuquerque, before the highway was later extended directly through the Tijeras Canyon pass between the Sandia and Manzano mountains, onto Albuquerque's Central Avenue. 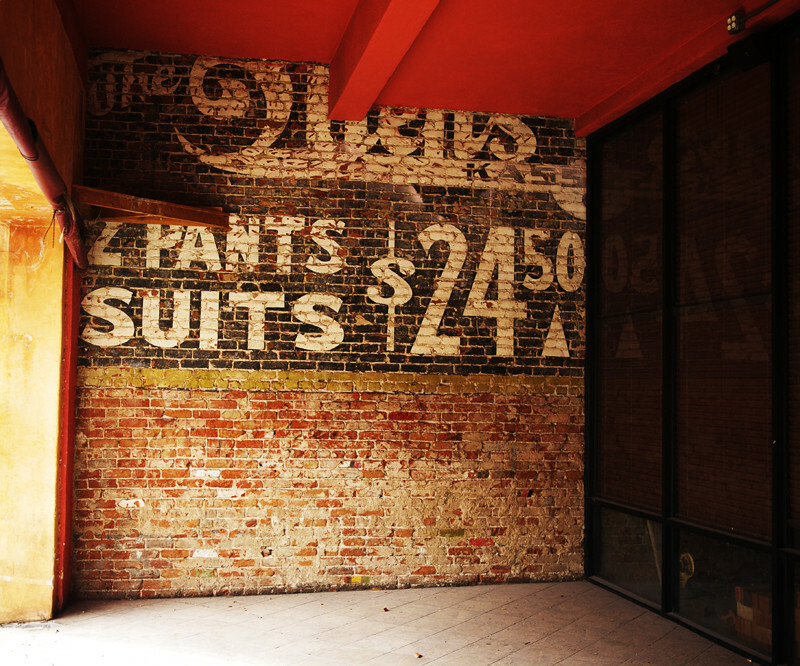 4th Street still has vestigial remnants from its days as a major highway through town, bead-like threads of old decrepit motels and shops that are far removed from their former glory, something that perhaps only urban archaeologists would make note of. There's a road that runs parallel to 4th Street several block east, and which was once populated by a variety of businesses known colloquially as "massage parlors," the Red Light District, which many newcomers to town would wonder about, why were they so concentrated in that one part of town. I'd have to give them the backstory of 4th Street being the original Route 66 through town, and how various businesses sprang up in the immediate vicinity to service the weary traveler's needs. But that era is so long passed that 4th Street has pretty much overcome its era of general seediness, retiring into the more genteel persona of cute north-valley history. Nowadays the seediness belongs to the Central Avenue corridor, a remnant of the Route 66 realignment that it has never fully recovered from, the area around east Central once known as The Combat Zone now renamed, in all of its political correctness, as The International District. After commuting miles north on 4th Street in the early morning dark, I'd turn west onto Alameda Road, from which I'd cross the Rio Grande on the Alameda bridge, and then slowly crawl up the steep hill into the neighboring town of Rio Rancho, where my 12-hour shift would begin. At night I'd retrace my route, the little two-stroke engine spewing a steady cloud of burnt hydrocarbons into the night air, the bike's little under-powered headlight offering little more than solace at the thought of a well-illuminated roadway. Sometimes it'd be hard to start, sitting out in the cold of the parking lot at work all day, and I'd have to manually choke the carb and kick start it to life, preserving the scarce battery voltage for the spark plug. A few years later I thought I needed a faster bike, a real motorcycle with a powerful 4-stroke engine and good headlights, and we decided that we had no more room for the little scooter in our lives. Now, I regret that decision, as I drive through morning traffic in my new car, slowing down for the school zones, admiring the brave scooter jockeys, wrapped in their warm garb, their layered jackets and scarves and gloves, their little bikes adorned with plastic crates behind the back seat for storage, or cloth bags hanging from storage hooks between their legs. I park in the alley behind the coffee shop, to avoid having to pay for parking, and wondering which, if any, University student's beater car will ding my new car's doors, then immediately thinking about how a new car suddenly transforms a person into a snob, knowing that soon the new-car smell will be gone and the grunge and dust of life will obscure that new-car shine. After standing in line and finishing my breakfast order, I'm eating and drinking and conversing with a guy seated at a tiny table against the wall, who's head is leaning against a bulletin board full of local notices for things like artist openings and poetry slams and local bands with names like "Then Eats Them," and alternative therapists and political causes so obscure as to be found nowhere else but in the University district. We're talking about old computer technology, the guy and I, a conversation that got started when he noticed the Neo that I was typing on; he thought it was some text-only keyboard used to troubleshoot old mainframe computers. Then we started talking about other technologies, in the same way that aged war veterans talk about their younger days, the main difference being that true war veterans never talk about the battles they were in, only about the good memories, wherein we started in on radio broadcasting, and he told me about his mother, who could pull in Mexican Radio broadcasts on her dental fillings, and also his Uncle, who could pull in Mexican Radio on his bed frame, all the way from San Jose, California. I tried to impress him with my theory that the corroded interface between metallic mercury amalgam fillings and jawbone created a diode-like semiconductor junction that was able to demodulate AM radio signals. I'm not sure he bought it, but he left a few minutes later after we exchanged farewells. It's a small world. Now, several hours later, I've driven across town, then north on the interstate to the town of Bernalillo (Burn-uh-lee-oh), where I've exited, taken State Highway 550 west, then onto the Santa Ana Pueblo and out a crazed, sun-grayed blacktop road that ends at the Jemez Dam Overlook. 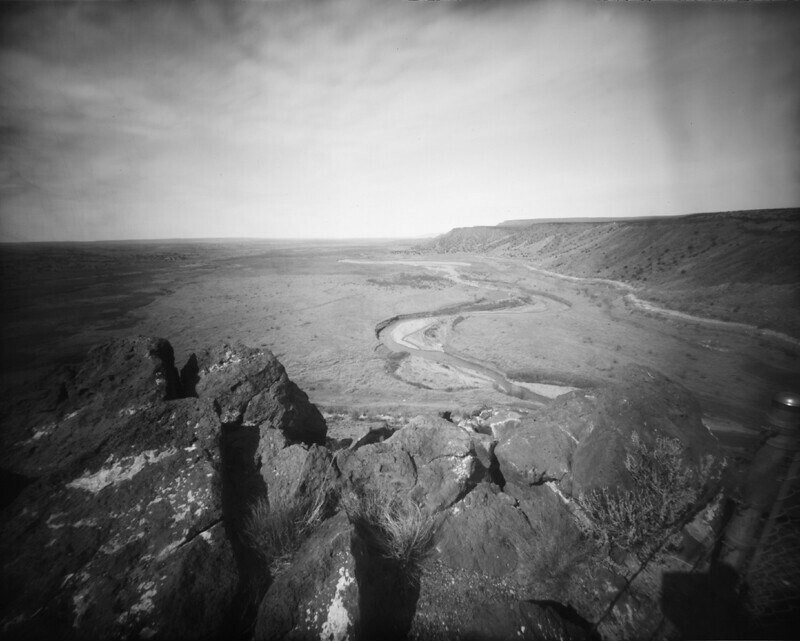 I've taken my digital camera, but also a tripod, backpack with light meter and calculator, and two 8"x10" pinhole box cameras, each loaded with a single sheet of black and white photo paper. This is faith-based photography in all of its glory. Whereas the modern digital photographer can immediately review one's images on-screen (an activity affectionately called "chimping"), and whereas the early photographers of the 19th century would immediately develop their wet-plate collodion images directly on-site, and could tell in a few minutes whether their efforts were rewarded with success or failure, the modern-day photographic Luddite, armed with pinhole camera loaded with some esoteric medium such as paper negatives, doesn't have the pleasure of knowing success or failure until many hours and miles have passed, and one is back home in one's darkroom, watching the (hoped for) image come up in the developer tray. One of these day, I'm going to take my portable darkroom box out with me, just barely large enough to process 4"x5" negatives, and give it a go with on-site processing, like some itinerant 19th century photographer, teleported into the future but unable to let go completely of the past. The sun is alternately blazingly bright and dimmed to soft shadows and an almost cold wind as a high, thin scud of clouds slowly crawls eastward, and I decide that it's time to hit the road and head home. Hours later, I'm back home, secluded inside my garage-based darkroom under dim, red lighting, watching the paper negative images come up in the developer tray, excited that, once again, the force of photons upon silver molecules has resulted in an image visible and yet mysteriously ephemeral, a document of an interaction purposefully orchestrated inside the Mad Scientist's cloud chamber laboratory of paper and cardboard. Epilog: This fascination our species has with technology interests me in the sense that, as a people, we possess both the ability to create and also to cogitate upon that which we have created. Transportation, communication, image-making -- we seem to be surrounded by the work of our hands and brains, all the more so with the recent advent of wireless, nonstop interconnectivity, so much so that it becomes too easy to lose our connection with the natural world. Standing up on that wind-blown perch at Jemez Dam Overlook, I was reminded once again about the power of silence, of stilling, at least for a few moments, the incessant external distractions and internal thinking processes, and just observing, quietly, the natural world that we live within. These humble black and white pinhole camera images remind me of that outer world, seemingly eternal and never changing yet in actuality constantly in flux, and how these inner and outer worlds are in desperate need of being reunified as one. It's early on a Tuesday morning in the middle of January. I'm seated at a long wooden table in a coffee shop in Albuquerque's university district. There's metered parking out front on the curb, adjacent to the patio tables and chairs. But I've parked in the back parking lot, accessed from the alley, where parking is free. In the winter, the electric doorlocks on my old car are intermittently unreliable such that one could easily get trapped inside, having to crawl out a window or over the back seat. So I leave the car unlocked, with valuables locked in the trunk. I've done this for months, and there's still no sign of vandalism or theft. Perhaps the security that locks provide is merely psychological in nature, that a professional car thief could easily get inside and do his dastardly will, regardless of my efforts to the contrary. I think it's a matter of return on investment, an economic calculation made by both the car's owner and the potential car thief; for the thief the calculus being centered on risk versus reward, while for the car's owner the calculation revolves around the cost versus inconvenience of a security system that's only partially effective. In this way, I believe we are all economists. Late last night I listened to a "This American Life" radio program, recorded in 2008 at the depths of the economic collapse, about the nature of money. Their conclusion was striking, that money doesn't really exist except as a mutual agreement by which goods and services can be exchanged. But money itself, no one knows how much there really is. For instance, say I have $100 and put it in the bank. Now, while the bank is using my $100 to lend out to others or invest (and they would claim that they in fact have my $100), I can simultaneously claim that I still own the $100. So that the money itself is now counted as being in the simultaneous possession of various parties, its value multiplied through a series of exchanges. How many times does my $100 count as taxable income for someone else? And what does it mean when I say that it's "my" $100? The program talked about debt, how the US Government owes trillions in debt, but that debt does not count the debt owed by the Federal Reserve bank itself, which prints money pretty much as it wishes, with very little accoutability on the part of the government. There was this story of a polynesian people who had as currency huge, donut-shaped carved stones, too massive to be carried or even moved by anyone. The stones would sit mostly in the center of the village, and their respective owners would refer to them as their property, as possessing wealth. Then, when someone owed a debt that had to be paid, they would use their stone for payment. But the stone, it would remain where it was, unmoved, along the edge of the road in the center of the village. Only the ownership of the stone would change. The stones were imputed with a sense of value as we value the currency of dollar bills. There were some of these stones that got washed off the island by a typhoon, years ago. Native divers could dive down, offshore, and visit the stones, ensuring that they are still sitting there on the bottom of the ocean. But the value of the stones remains as currency to the tribe, being bought and sold and held for a rainy day. It's like buying shares of stock in a company, you don't really own a steel girder or office desk or square of carpeting from the company you've invested in; rather, you own only in the abstract some small, infinitesimal percentage of the company's current worth, while the company itself remains as those round stones, physical and immovable, existing in the real world apart from the abstraction of valuation and worth that we apply as totems to physical objects. These swirling currents of thought fade to the earthy reality of life in a dingy university-area coffee shop on a sleepy Tuesday morning. I'm eating my breakfast while across the aisle there's an older man, short and balding, seated at a small table. He's holding a small transistor radio up to his ear. He mumbles to himself and has open on the table a journal book into which he jots down words, after sitting and staring into space, mumbling and cursing under his breath. I make a phone call, then find out I need a pen with which to write down directions (one of the after-effects of going solely with the Neo is I'm not used to note-taking with it). I walk up to the counter, cutting in front of a customer waiting for coffee, and proceed to write down directions on a sheet of paper using the counterperson's pen, unapologetic-like, purposefully ignorant of others' concerns. I return to my table, finding my digital camera and Neo keyboard are still sitting there. The small man, he's still mumbling to himself. There's that odor again, filling the room, an odor of uncleanness that wafts on the still air of the coffee shop. It comes from an older lady, dressed in rags, legs bundled in cloth, a soiled, off-white blanket wrapped around her, from head to foot, like a pancho. She has enough money to order a cup of coffee and breakfast, which she does almost every day. Her name, I've been told, is Cherokee; at least, that's what people call her. She's a street person of sorts, although I'm not really certain about that; she may have a room or apartment somewhere in town. I know she gets around mainly on foot. Last week I saw her walking east along a main street, miles from the coffee shop. She was still wrapped in her dingy blanket, her legs wrapped, slowly trudging up the sidewalk. I can see Cherokee right now through the glass window of the coffee shop. She's sitting at a patio table on the sidewalk in the morning sun, drinking coffee and eating some plate of hot breakfast. Steam rises from her hot cup, as she sits staring into space. What does she think about, where is she going? I wonder about these things, about the lives of people that are so different from my own. I notice little things here, like most every person seated alone at a table is also accompanied by a laptop computer, as though in the company of a mechanical friend through which they won't feel so lonely, which they appear to be using mainly for surfing the Internet. The exceptions are a group of four guys, seated at the counter adjacent to the coffee roaster, chatting and eating breakfast. That, and a young couple who've just sat down, perusing the local college newspaper. The little writer man has returned from the restroom, seated once more, and is now staring down the hallway and out the back door, pen in hand, waiting for some inspiration to hit so he can record words on paper. The journal book, its pages are brown recycled paper. He writes with a black gel pen, while a red one sits on the table next to him, along with his glass case and old man's plaid fedora hat. He's gotten up from his table now and walked over to the counter, chatting with one of the four men. They're obviously regulars. He holds his transistor radio in his hand while he chats. There are paintings on the wall, acrylics, colorfull and amateurish-looking. I don't really know what amateurish really means, in the sense of distinguishing a style or quality from that which may be understood to be of professional quality. I just don't know; perhaps these amateurish acrylic paintings are able to be sold for money, which would make their creator a professional, would it not? Unless one has to make a majority of one's income from painting before the label of professional would apply? Like some carefully calculated percentage of one's income: 49% and you're an amateur, while 51% makes you a pro. I'm thinking the term professional implies a field of endeavor where some philosophy or world-view is required to be held in order to succeed. Like one has to profess a belief in order to be a professional. I can understand a professional scientist would profess the belief in dielectical materialism and humanism. But what about a plumber, what would he profess? Maybe being a plumber is merely a trade rather than a profession. Trading a service or skill in exchange for money. I wonder what Cherokee's profession is, what she does, day-to-day, to stay alive. Perhaps a pension or stipend keeps her in the barest of essentials. I don't know. But it seems that she exhibits an underlying belief in an ability to survive, day to day, as if her humble existence, slowly ambling through other's lives while exuding the aroma of the unwashed, were her mission statement, that life itself doesn't require explanation or justification, life just is. The large room of the coffee shop begins to fill up with new customers, the noise level slowly elevating. Whereas it started out as a quiet and sleepy early morning, it will soon be a humming crescendo in here. Time to go.